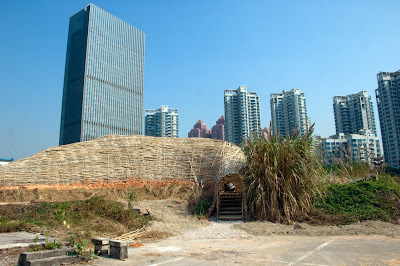 The building is realized on a wasteland of a ruined building site in-between the Shenzhen City Hall and an illegal workers camp. The design is inspired by insects. 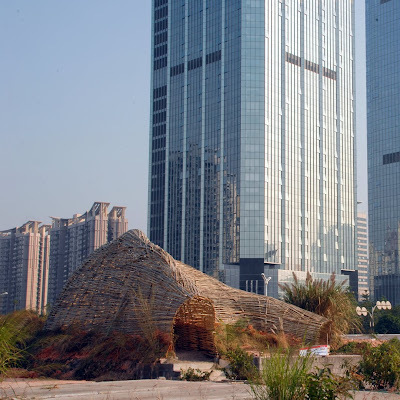 The bamboo construction methods are based on local knowledge from rural Guanxi brought into the city by the migrating construction workers. The space is used during the SZHK Biennale for underground bands, poetry reading, discussions, karaoke and as a lounge for the illegal workers from the neighboring camp. 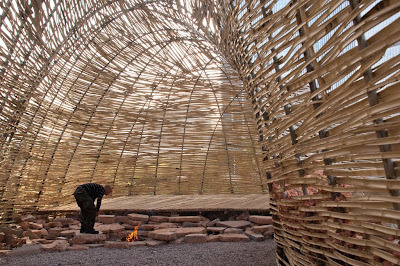 The building offers a shade, a stage and a fireplace. 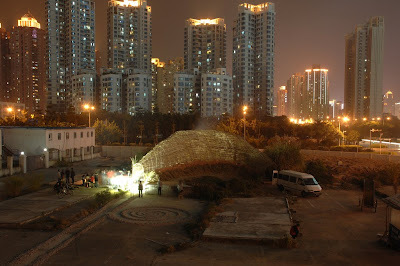 After the Biennale the Bug Dome will act as an un-official social club for illegal workers from the Chinese countryside. The building is weak, flexible and improvised to meet the site-specific conditions. It is growing from a ruin. The architectural control has been given up in order to let the nature step in. The weak architecture is a mediator between the human nature and nature. The construction is a result of participatory planning between the designers, construction workers and local knowledge. The cocoon is a weak retreat for the modern man to escape from the strength of the exploding urbanism in the heart of Shenzhen. It is a shelter to protect the industrial insects from the elements of un-nature. When the fire is up a society is born again. One has to take the liberty to travel a thousand years back in order to realize that the things are the same. Let everything that has been planned come true. Let them believe. And let them have a laugh at their passions. Because what they call passion actually is not some emotional energy but just a friction between their souls and the outside world. And most important: let them believe in themselves. Let them be helpless like children, because: weakness is a great thing and strength is nothing. Bug Dome by the WEAK! 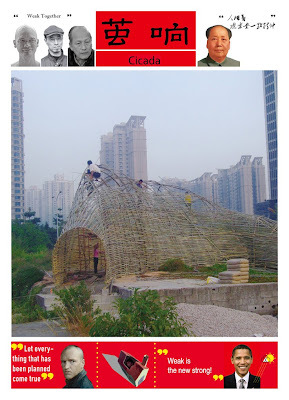 The Bug Dome is a result of discussions between Marco Casagrande, Hsieh Ying-chun and Roan Ching-yueh. Together we are the WEAK! Insects inspire our construction methods. WEAK! Architects are the industrial insects. The design process was painful. We were all ripping the design to all three individual directions but in the end we gave up and the design became the boss and we learned to listen. Architecture gives the commands and architects listen. To design is not enough. Design should not replace reality. 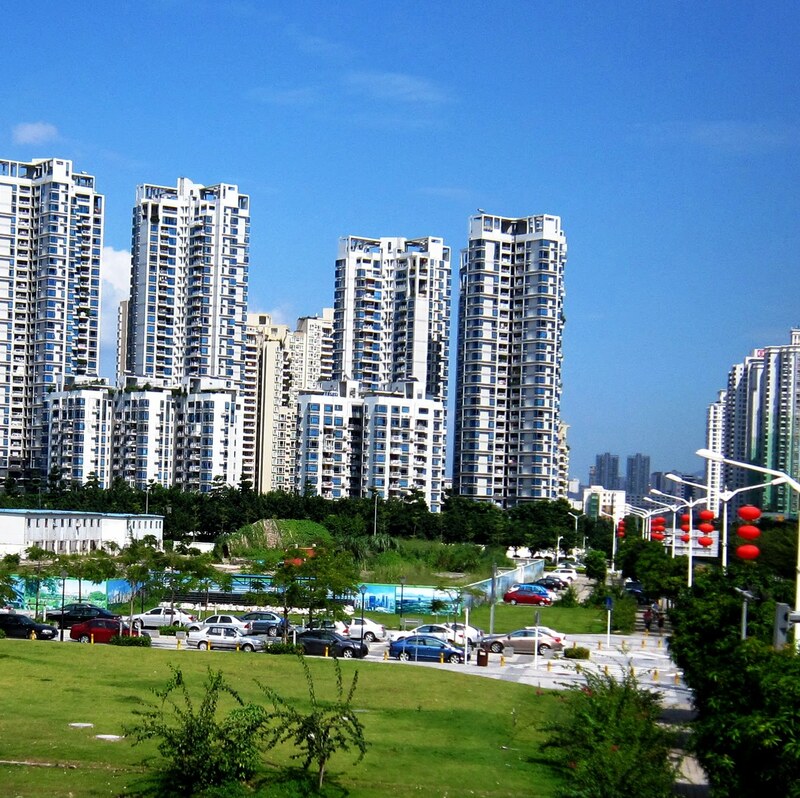 The building must grow from the site; it must react for its surroundings, it must reflect life and it must let to be itself, like any other living creature. Architectural control is against nature and it is against architecture. Built human environment is a mediator between human nature and nature. Man must be weak to be part of nature. Bug Dome in front of the migrant workers camp. When the “design” was brought to the site, the site got to it. The interpreters between the site and the design were the construction workers. 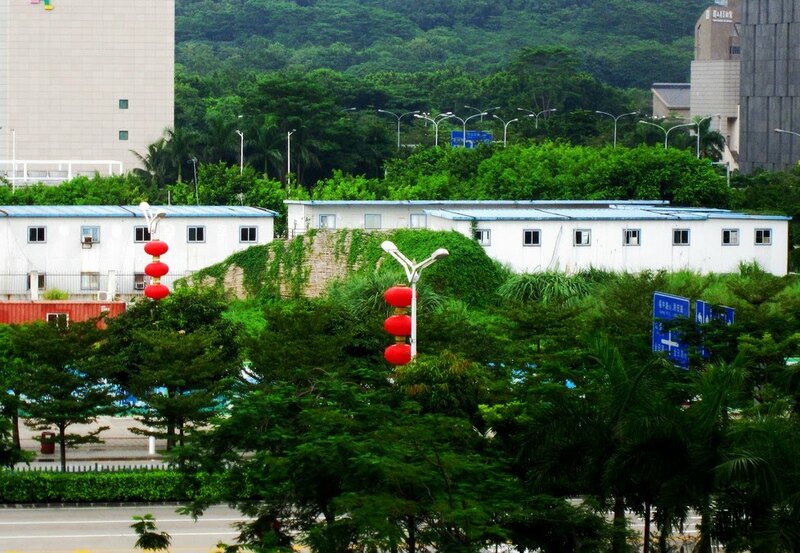 Our team came from the rural areas of Guanxi, Henan and Sichuan. They bought to the city with them the connection between the modern men and nature – local knowledge. The same hands that build the Bug Dome have also build the modern Shenzhen. Shenzhen is a manifest of control; Bug Dome is manifest of weakness. What comes to architectural control, we must give up in order for the nature to step in and for the human nature as part of nature. Un-official social club for illegal workers. Our construction workers were sensitive, creative and responsible. 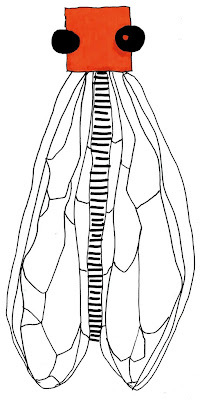 They knew how to construct nature as insects do. As architects we had to become part of them to gain soft, organic and moving space. 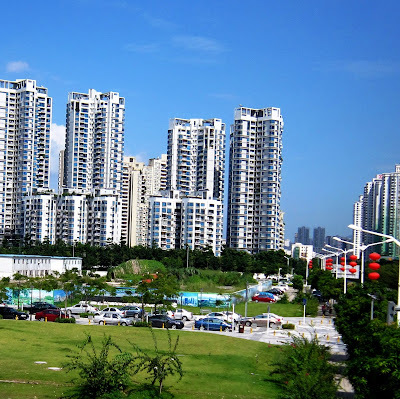 In large scale, if we learn to understand the connection what the hundreds of millions of hands that are now migrating from the rural China to the modern cities might bring along them, we might be able to ruin the industrial city. 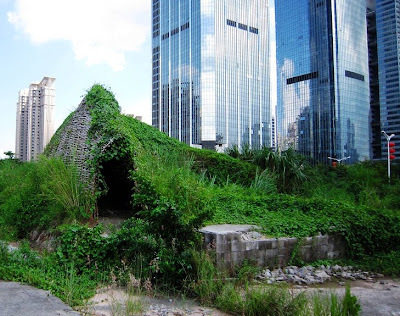 We might be able to make the city to be part of nature. Free newspaper Cicada by WEAK! for SZHK Biennale 2009 edited by Nikita Wu. READ!